Youth Empowerment Program – Southern Chiefs' Organization Inc. Step 1 of YEP! 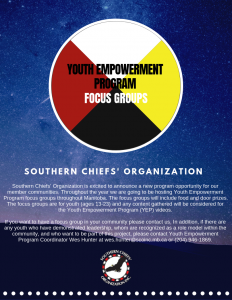 is to host Focus Groups with youth throughout Manitoba. The Focus Groups will be open discussions on what is important to the participants.